If you’ve been reading along you know I’ve been writing a series this month. Today you get a two-fer with Lisa-Jo Baker for Five Minute Friday. As I stand in front of the washer armed with stain stick in one hand and laundry in the other, I wonder if it would work anywhere. Would the stain stick magically erase evidence of mistakes from the past? Is there a bleach that is not fabric safe, but life safe? Non-chlorine and gentle on all my wounded places? I could really use something that will fix it all. Something that will make the white of my eyes brilliant and the blue sparkle like the sea. Because here’s the truth. I’ve been disillusioned and my eyes aren’t so clear anymore. I’ve spent days upon decades looking at myself through dull iris’ and irritated whites. I’ve spent all this time looking at myself through the page of a magazine or the glow of a screen that I’ve damaged my eyes and now they’re dirty. I don’t know how to get rid of that stain. It’s been so long all I can see is the dull staring back at me, and I need a change. Magazine pages and TV screens don’t fit in the washer, and I so desperately need to be clean. So my first step, my first breath, is to lay them down. Once the glossy pages and bright screens are out of my hands I realize there is a part that was never dulled. The little black pupil in the center of it all was never dirty. It always held the truth and saw the truth. So that is where I’ll start. The only place to start or end, the place of truth. I’ll breathe in that center place deep in the heart of my vision. That’s the only place that ever mattered. If I look through that place, the laundry is done and the stains are gone. My eyes are clear and they sparkle. Dancing in the beauty of the center place. 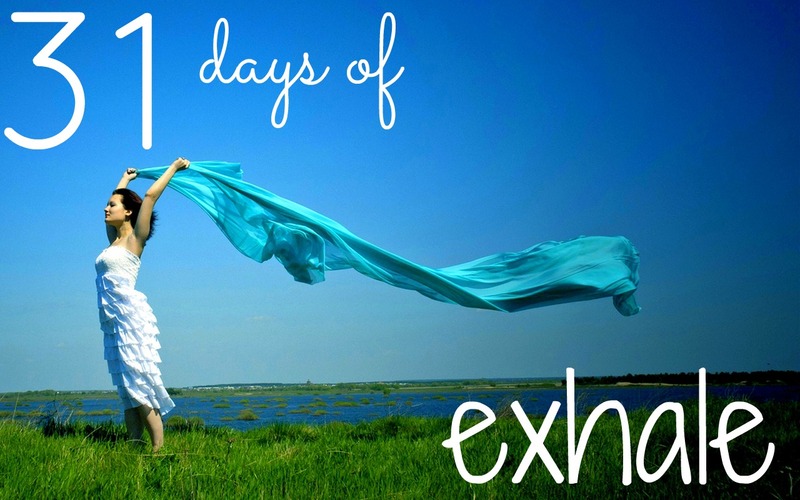 If you want to join in check out Five Minute Fridays and if you’ve missed any of my 31 Days of exhale, please click on the link below!